Feral hive i thank, but no treatment . was said to remove entrance reducer. Have added 2nd med. drawn comb. Temps. 88° in day to 95°. Bees still out side is this normal? Re: Is this normal ? Looks good to me Mikey! Share that which you have an abundance of. In doing so both the giver and receiver are enriched. 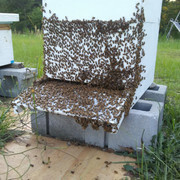 Humidity can push them out, because it is more difficult to cool their hive with evaporative cooling. Looks within the bounds of normal to me. I agree with Lee. The girls are helping to maintain an appropriate temperature. I've heard that you should turn cinder blocks so the holes face outward, rather than up. Something about bugs or critters getting better access to the hive when the holes face up. So, did I get it backwards? mikey, what ted and lee said! fanning, some bearding and a little washboarding maybe. the bees on the face of the hive are facing the hive entrance, abdomens, butts in the air, same on the landing board, many bees facing the entrance, in a 'fanning' stance.........if that makes sense. if you look closely yourself, you will see that their wings are moving, 'fanning' the hive. Question is it ok to go in hive with bearding bees like this ? yes mikey, but i would do it when cooler in the morning or later in the day, use your smoker to move them if need be. you don't need to 'gas' them or send them scurrying.... just enough to move to inspect. good luck! Yesterday I went completely through this hive . re: overwintered 10deep an med. with sugar cake on top. Med. full of capped honey this spring. 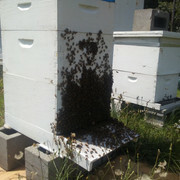 Added another 10deep with drawn comb, when Q had 2 1/2 frames of capped brood. Not feeding. Bee's started filling 2nd 10deep with stores and nectar, looked like bees were moving honey down from med. (Plus flow) . Q moved up and had 2 frames full of capped brood in 2nd 10. The rest was full of pollen and uncapped nectar. So i added another med. super and moved med. with capped honey to the top. 3 -4 weeks ago.So yesterday i seen that Bee's have drawn 8 frames. in med. with some nectar. Top med.capped honey. Was looking for swarm cells . Q had 3 fully capped worker brood in 2nd 10 , 2 Q cups(empty) 1 frame fresh eggs the rest was stores. Bottom 10 box, 2 1/2 frames of capped worker brood, 1 frame full of drone capped brood. NO SWARM CELLS. What gets me is that all other bees that I've bought fill all frames full of eggs. This Q (feral i think) however seems to have a selective laying pattern by moving around the 2 ,10deeps ? Something I've not seen but it's working. Question if this hive never attempts to swarm, should i split ? I would not, with the queen only laying on 7 frames I would be contemplating raising a new queen on the top of the hive. It is amazing how much honey goes into raising brood, the amount of nectar and pollen that can be stored when it is not needed to feed the developing brood. Raise a Queen on top ? What method are you referring to ? Put a frame of brood in a super above a queen excluder with an top entrance to the rear and the bees will draw out a queen She will mate and be back in the hive laying up top then combine and the young queen generally takes over the hive. "Question if this hive never attempts to swarm, should i split ?" appears to be a very robust hive mikey? i wouldn't split (as apis said). i would take advantage of a robust hive to produce a honey crop for you.